I've had the opportunity to photograph all of the 168 lighthouses, and nearby attractions in New England, and spent years researching and writing about each lighthouse for each of these 300-page books. You can order either of these books through pages on this website, or below, and I'll be happy to personally sign them and ship them to you. You can also order from the publisher, Schiffer Publishing, and you'll find them in many fine bookstores. Enjoy your passion! 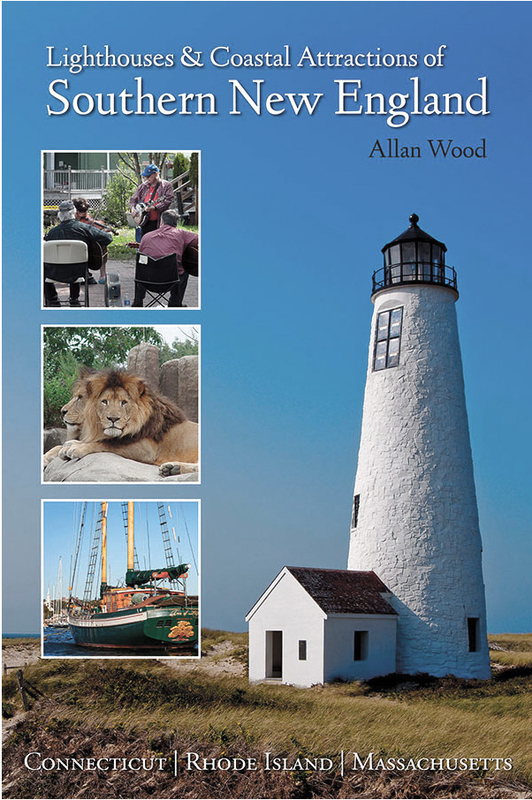 This book, Lighthouses and Coastal Attractions of Southern New England: Connecticut, Rhode Island, and Massachusetts, provides special human interest stories from each of the 92 lighthouses, along with plenty of indoor and outdoor coastal attractions and tours nearby, info on lighthouses you can stay overnight, haunted lighthouse stories, windjammer and whale watching cruises, and lighthouse tours, with contact info to plan your trip. 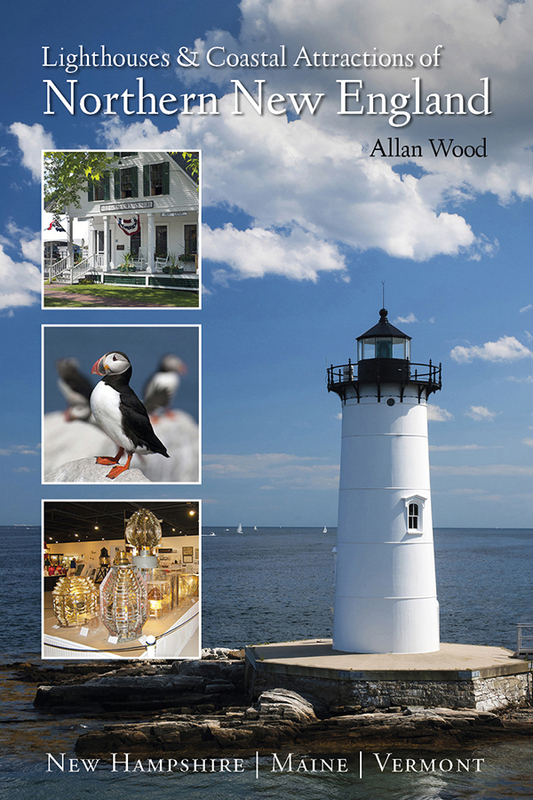 This book, Lighthouses and Coastal Attractions of Northern New England: New Hampshire, Maine, and Vermont, provides human interest stories from each of the 76 lighthouses, along with nearby coastal attractions and tours near each beacon, and contact info to plan your special vacation. There's plenty of addirional information on lighthouses you can stay overnight, haunted lighthouse stories, windjammer, sailing, and whale watching cruises, and spedial lighthouse tours. Each of these new lighthouse tourism books contain more than 360 of my color photos and maps, along with some vintage images provided courtesy of the Coast Guard, with over 300 pages. For tourists, historians, and lighthouse enthusiasts, you'll find driving and hiking directions, and historical human interest stories of special events and rescues around each lighthouse. Lighthouses are set up in regions for weekend or weekly vacationers and travelers. You'll also find infomation on various lighthouse and boat tours, whale watching, windjamming, and sailing tours, along with plenty of descriptions of attractions and other sites of interest, including some attractions off the beaten path, within the coastal communities these beacons have long protected. There is also information on lighthouse history, stories of haunted lighthouses, information regarding lighthouses you can stay overnight, and organizations involved in lighthouse preservation, along with contact info to these businesses, parks, and organizations. 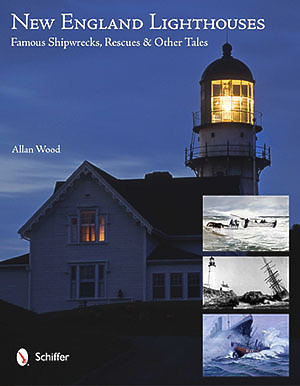 This book was developed to provide the reader a series of stories that encompass the brave men and woman of New England who risked their lives at or near New England’s lighthouses. These individuals were not only part of the lighthouse, lifesaving, and revenue cutter government services of the 19th and early 20th centuries, but also encompass a town’s own citizens, local mariners, or a ship’s captain and crew, who would also risk their lives alongside their government counterparts in helping those in distress. This book not only includes photos by myself, but also paintings by six famous artists for the Coast Guard, and vintage images from the Coast Guard, museums, special collectors, and historical societies who all wanted to contribute to this book. This book contains not only stories about lighthouse keepers and their rescues, but also selected rescue stories by their wives and even dogs involved in rescues. There are also heroic stories of crews of “surfmen” from lifesaving rescue stations that were established between lighthouses, including a famous rescue by the Wampanoag Tribe of Native Americans in Massachusetts. There is a remembrance of one of the most dangerous of all marine professions, that of being a crewmember aboard a lightship. There are also stories involving coordinated efforts between those employed within the three branches of rescue service, along with local fishermen, lobstermen, or captains of steamships that would risk their lives to help those in peril. It is also important to learn about some of New England’s worst costal disasters, many near our lighthouses, that pioneered travel safety and techniques used today. There were also accounts that were documented up to, and sometimes including paranormal sightings. The lighthouse hauntings section, though it may be entertaining, still involves a journalistic approach to the events leading up to some of these paranormal activities, through research into the folklore of the story. Many of these sightings described were by respected townsfolk, mariners, or lighthouse keepers themselves. You can order this book through this site using PayPal and I'll be happy to personally ship it to you, and sign it. You can purchase it from the publisher; Schiffer Publishing, or you may find it at your local bookstore, or Barnes and Noble, or online. © Allan Wood Photography, not for commercial use, educational use only. Do not reproduce without permission. All rights reserved.